Fresh enhanced meat products have a short shelf-life; Putrefactive spoilage is caused by pseudomonads and is usually restricted to regions near the surface of ground meat. Inside ground meat products, spoilage will be “souring” from growth of lactic acid bacteria and Broch. thermosphacta. Psychrotrophic Enterobacteriaceae often forms a significant part of the flora. Besides, fresh enhanced meat is susceptible to oxidation causing colour change and rancidity. Microbial control, color retention and rancidity avoidance will be considered as a whole for shelf life extension. 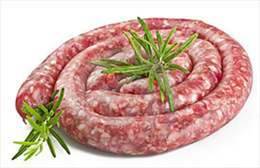 For examples, fresh pork sausage is made with hot boned pork, meat is comminuted at ≤−2◦C to obtain a clean cut and optimum appearance, and the mixture is stuffed into hog, sheep or synthetic casings or formed into patties. Chilled-stored fresh pork sausages deteriorate relatively rapidly due to both aerobic plate counts and oxidative rancidity. Putrefactive spoilage is caused by pseudomonads near the surface of low-salt sausages, and Gram-positive bacteria (Broch. thermosphacta and lactic acid bacteria) inside comminuted products.